I recorded the roof of the main building in the farm village, and I painted for myself, the result of the passage was recorded. When about ten years pass from building, the roof of such a cement tile becomes bald the painting of paint, grows mold and the moss, and is deteriorated. It comes to have to tile the roof to putting away deteriorate it advancing fast and to substitute it if it doesn't paint again. Why should we paint on the cement tile and the slate roof? It is because a small hole is innumerably open on the surface of the cement tile and the slate roof. It causes the moss and mold for water to do to the hole, to see, and to grow. Moreover, the hole is expanded in addition because it makes to winter, the seen water freezes, and it expands. Seeing in the other side of the photograph below is a main building of prefab house. As for this, about 12 years pass from building. This roof is a cement tile of SEKISUI. It painted with the high-pressure washing only one for myself (With DIY). Because it is possible to work only on Sunday, it takes about two months to finish. 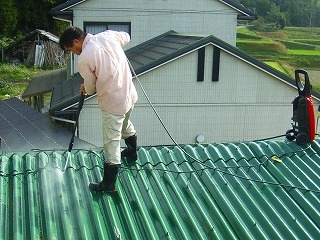 First of all, the way of the high-pressure washing removes the moss and the dirt of the cement tile similarly to the slate with the high-pressure washing machine though this photograph is the one when the high pressure of the slate roof is washed. This work especially put up the life rope in the building of two stories because it was dangerous. Because the moss and dirt are especially awful, dirt is deliberately washed off on the north side slope of the roof. It works from the roof toward below. It is made to never get on the part not washed because it is slippery. I think that sport-type shoes are safer than it gets into one's boots even if getting wet of shoes. It took about three days for this work. Paints used "Undercoat medicine and oily sticking sealing coat 14L for the building" of Kansai Paint. This is a concrete floor side in the wall of various color slate tiles, newborn tiles, the cement tiles, and the concrete mortar, verandas, terraces, and porches, and the one sold for the undercoat of the concrete block. The feature of this undercoat medicine is following. The foundation of a concrete side, the cement tile, and the mortar that is deteriorated and became fragile is strengthened, and adhesion with the top coat paint is improved. It often infiltrates foundation, and concrete and the alkali on the mortar side are held. The top coat paint is prevented being inhaled, and the waterproof property and the durability of the top coat paint are improved. It is a regret weak solvent type to repainting strangely as for an old paint film. There is no strong foul odor like past oily sealing coat because it doesn't contain the toluene. It is mixing the silicon resin, the sticking power and the durability of the top coat paint are improved further. In this undercoat medicine, externals are feeling like kerosene. I think that I paint it easily because I flow transparently easily. It paints it toward from the roof under on. It paints it sitting on the part where it doesn't paint above. Never get on the painted part because it slips. All almost 14L cans were needed. It took about three days for this work. The feature of the paint paints is following further. A strong paint film is made in the dirt such as acid rain, the snow, the salt damages, and ultraviolet rays and vehicle exhaust emissions by the acrylic silicon resin mixing, and the external appearance of a building is kept beautiful. The acrylic silicon resin improves weather resistance, and it keeps. Moreover, durability is also preeminent. It excels in the resistance to water, and the roof of the residence is defended from rain water and the snow. It strongly sticks to a cement tile and a newborn tile with an efficient, oil and fat silicon paints using a special resin besides the tinplate. The working efficiency improves (about 30 minutes in the half stiffening) and dry time are short. I did not think it was especially difficult though the oil-base paint was used because the paint that placed to the brush as follows was washed and the device that omitted the dropped work was done though generally said that the treatment of the water-based paint was easier. Because it is cold in winter, the final coating work decided to be done only once following the undercoat for the time being, and to make the paint work after ..regarding.. twice after spring. When the temperature is low, postponing paints is bad, and power is necessary for the work painted with the brush. Work should be postponed since it is spring in this respect. This acrylic silicon resin paints that were able to be used also for the metallic portion after rustproof paints of oily had been painted on the part of a metallic cover around the roof were painted twice. After using the oil-base paint, the paint reducer is necessary to wash the paint that places to the brush and to drop. Because I did the same work dividing into times how many, it seemed that this work was very troublesome. Then, the method of omitting the dropped work was devised by washing the paint that placed to the brush.It puts in the coated can without washing the paint of the brush when the painting on the day is finished and dropping and the lid is sealed up though the painting work is done with the paints. The paint that places to the brush need not be washed if it does so. The handle of the brush is cut a little when the brush is large and it doesn't enter the can. It might be an ingenious way how. Even if such a thing is not done, it is easy for the water-based paint because it only has to wash the brush in water though can do similarly even by the water-based paint.